Schools are already starting everywhere. We haven't started yet and will not officially start until the end of the month. We always have our official start and end dates even though we still use review items, practice their instruments, work on their cooking and art skills all summer. Between homeschooling for 21 years and reviewing homeschool curriculum we have a large selection to choose from. 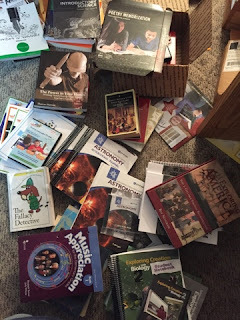 Even though I pretty much know what I'm going to have each kid use for the upcoming school year I still like to make piles all over the family room floor.